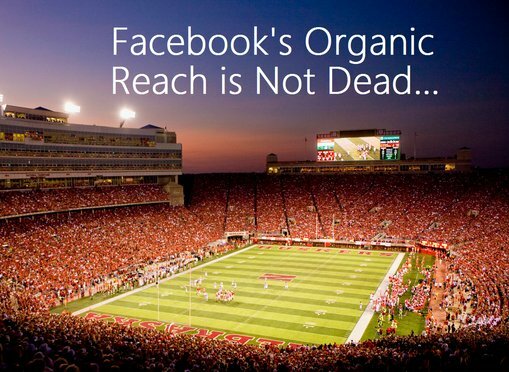 There’s been a lot of hubbub in recent months about the death of Facebook organic reach for company pages. In essence, Facebook keeps tweaking its algorithm that affects how much (or little) content will appear in users’ news feeds. For example, say you are a fan of “Nike” on Facebook. With the change in algorithm, fewer of Nike’s posts will appear in your news feed. In fact, some estimates have put organic reach at a paltry 1% – meaning that only 1% of a page’s fans will, on average, see their content – without the company having to pay for it to be seen. But I believe that the death of Facebook organic reach has been exaggerated. Let me explain. No - Content is King! One of my passions is Nebraska football. Being a Husker fan living in Southern California can be a bit lonely at times, with so many USC and UCLA fans everywhere. One of the ways to stay connected to other Husker fans is through the local Nebraska chapter. When I started getting involved with the chapter several years ago, I noticed they didn’t have a social media presence. These days not having a social media presence is akin to not having a Web site! I casually mentioned this to our chapter president – that as a PR person I worked with social media as part of my job and would be happy to start a Facebook page on my own time if he was agreeable. That was in the summer of 2011. Little did I know that in 2015 our Facebook page would be the largest and most interactive of any Nebraska chapter in the country! As the page administrator, have I seen a decline in organic reach the last few years? Absolutely. But has that stopped me? Of course not. Contrary to common belief, you CAN run a successful Facebook page without breaking the bank. How? Content! Just as with any other communications platform, content really is king. Facebook will still “reward” you for producing interesting, compelling and relevant content. But to do this, you must know your audience and understand the type of information they crave. Keep the overly-promotional posts to a minimum. Space out your posts so as not to bombard your fans with several posts at once. Packaging is also important – don’t simply slap up a random article or photo with no explanation as to why your fans should care or with no real effort to draw them in. Encourage people to comment or ask them a question. Social media is a two-way form of communication. It’s about creating a sense of community and making your fans feel important and that their opinions matter. It is true that Nebraska fans are some of the most passionate people in the country. So you might think that it’s a lot easier to create a successful Facebook page for a rabid fan base like Big Red Nation. But the same principles I’ve outlined can most certainly apply in the tech world. You just have to know your audience, provide them with great content and treat them right.